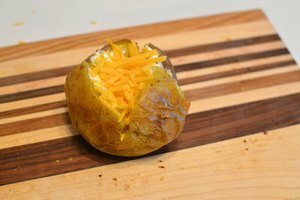 What Goes Well With Roasted Potatoes? With their slightly crisp exterior and warm, mealy, dense insides, roasted potatoes are one of the most satisfying and easy to prepare side dishes. The key to good roasted potatoes is choosing the right type of potato, and matching your seasoning options with how you plan on using or serving roasted potatoes. 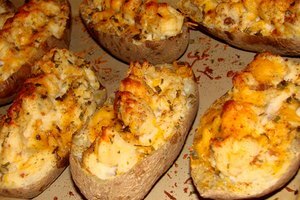 If you are serving roasted potatoes as a side dish, the amount and seasoning you use largely depends on the main course. For example, fennel seeds for roasted potatoes work well if you are roasting a chicken over top of chopped fennel. For a Greek-inspired dish, garlic, oregano and lemon juice may be all you need to season your potatoes. 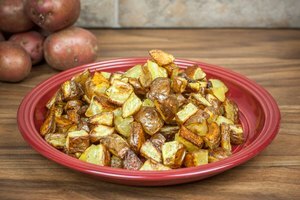 If the roasted potatoes are the main feature, as in a roasted potato salad, keep the potatoes relatively neutral so the seasonings don’t interfere with the taste of the dressing. Fresh herbs such as basil, parsley or thyme work wonders with freshly roasted potatoes. 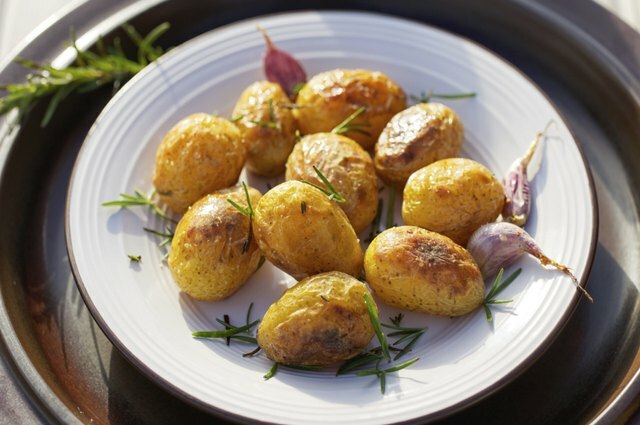 However, the high heat required for roasting can lead to burned or charred herbs, so it is best to toss potatoes with fresh herbs after cooking. The heat of the potatoes cause the seasonings to wilt and release their natural oils, adding a gentle flavor. 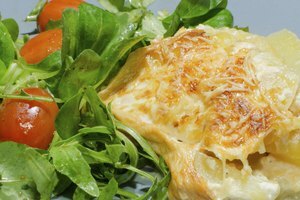 Use only finely minced herbs, as large chunks such as large pieces of garlic or whole mint leaves may lead to too much flavor in one bite. Dried seasonings, from rosemary to steak spice, may be tossed with potatoes prior to roasting. This helps the seasonings stick to the potatoes better and adds a coating of flavor to the exteriors of the potatoes. This leads to more evenly seasoned roasted potatoes. The classic combination is garlic and rosemary — garlic powder and dried rosemary mixed with olive-oil-coated on the potato pieces. If you are using dried spices, toss both the seasonings and the potatoes with oil before cooking to minimize the chances of burnt spices. Roasted potatoes require a layer of fat to seal in moisture during cooking and to help the exterior crisp. While olive oil or vegetable oil work well, consider using other fats with a high smoke point, such as bacon fat or duck fat, to coat the potatoes. The high smoke point is needed as roasting takes place at high temperatures, 350 degrees Fahrenheit or higher, and some fats, such as whole butter, can burn. 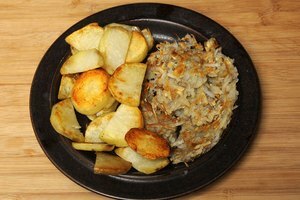 Toss potatoes to coat evenly with oil before cooking. Add some acid such as lemon juice or apple cider vinegar to roasted potatoes before or after cooking. The acid helps cut the richness of the oil and adds brightness to roasted potatoes.